Bunny A: What's she doing? Bunny B: Smiling and talking to herself. Taking photos, like she always does. What's that she said? "How silly is this?" Bunny A: Taking pictures, that's what she's doing. She just took some of us. You know she's going to put them on her blog, don't you? Bunny B: I know. Do you think she'll be brave enough to put the pictures she's taking of herself on the blog? Bunny A: I doubt it. My hair looked virtually the same this morning as it did last night and when someone suggested that I document the ultra-straight look, I did. ( I had my hair cut yesterday and the stylist always straightens and flattens it to the extreme.) There are a few bits and pieces in the back that are starting to curl, but otherwise, it's the severe look. Is there anything so ridiculous as taking one's own photo? Those editing features in Picasa are wonderful for minimizing wrinkles and such. Ha.... you showed those bunnies! Cute pictures of them and you, Lorrie. I don't think the cut looks severe, it looks chic and current, I would however like to see your hair light lighter, it will give even a softer look...Loved the bunnies, I use to make them that looked like that...so sweet.. Hair is very elegant, a la Audrey Hepburn. Do you think Picasa would permanently edit out wrinkles?? I wish I could take a picasa version of me on the road! Nice do! Ha... tell those bunnies we are glad you put their pictures and yours on the blog. We enjoyed seeing all of your smiling faces. Those bunnies are so cute Lorrie. Did you make them? I think your hair looks great. Such a cute cut. When I come home from the salon it is usually the opposite problem. She poofs it up more than normal and sprays it heavily. My son once told me I looked like Marge Simpson (from the Simpsons). I didn't take that as a compliment. LOL. Well those bunnies tricked you - what lovely photos. Oh, and cute bunnies. you have to watch bunnies all the time or they get into mischief. I'd say you did very well with the self-portrait. I like the new look, and I liked the old look. I think it must be fun to be able to change the look with your mood! You look very pretty, Lorrie, and i love the way your bangs look -- that s how I'd love to have mine look. I think I ave to buy a flat iron to get the same look. PS: Those bunnies are really cute! Did you amke them? 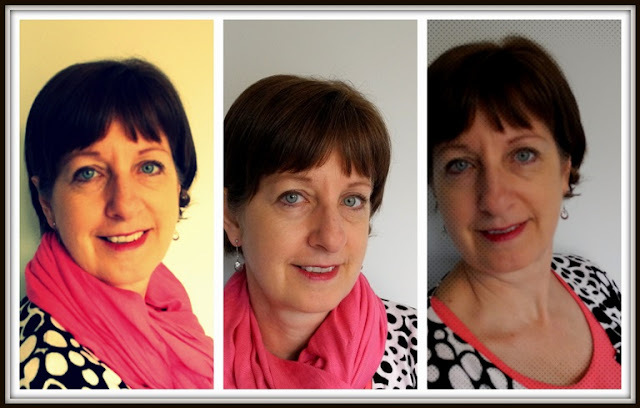 These are great pics of you Lorrie -this style suits your face perfectly, color is lovely with your eyes, and I know you can probably wash and go without much fuss and bother! As for the bunnies - did you make them and dress the in the pretty fabrics? Bet you did. They're adorable! Hello beautiful lady, your bunnies are adorable! Oh these bunnies are such a perfect Easter gift for the girls. I feel like a real plain Jane when I walk out of the hairdressers. He feels compelled to load my hair with gunk and use straighteners too!!! Like you I can't wait to wash it and do my own thing! You look GREAT! Love it! My hairdresser always sends me out the door with super straight hair as well! It's what they DO!! The bunnies are adorable.... I should drag mine out. None of the kids will be here for Easter.... so I won't. ha! The bunnies and you are cute! Your hair looks great! I know the feeling though of the straightness. My hair is straight, but even strighter when the hairdresser does it! It does not feel right until I wash it and let it have a bit of bounce. What gorgeous bunnies! I hope your angel girls loved them. I adore your new profile picture. So pretty! Today I am rejoicing that the tomb was empty. Wishing you and yours a very Happy Easter! The girls will be delighted with their bunnies. I hope you've enjoyed Easter with your family. I didn't realize that Picasa could remove wrinkles - will have to experiment. Sometimes I take a picture of a new haircut because I can never seem to get it looking as good as when I walk out of my hairdresser's. You look very nice in your pictures - the bright colours suit you!